Pride of the archeomancer guild in his younger days, Magus Vitzhago's growing eccentricity was regarded with indulgence for many years; after all, if a mage can't be eccentric, who can? At last, however, after several incidents which were rather disturbing (and in once, downright gruesome), Vitzagho disappeared from the public eye. No one has seen him for years. Has he finally gone mad? Is he in seclusion? Dead? 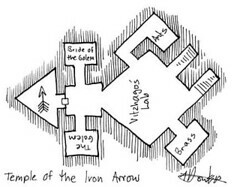 Now the guild has offered a sizeable reward for whoever might enter his lab in the abandoned Temple of the Iron Arrow, determine what has happened to him, and return his staff of office to the guild. Welcome to Microdungeons.com. I'm still getting this thing ready, but here's the plan: starting in the first week of January, I'm going to post 3 new microdungeons a week. If you want a preview, you can see some of them on my Flickr page.